Retro design sapphire and diamond ring. Product code: 447 Categories: Sold Items, Sold Rings. Retro designed pieces are so back in vogue at the moment, and a ring like this is sure to delight the wearer. 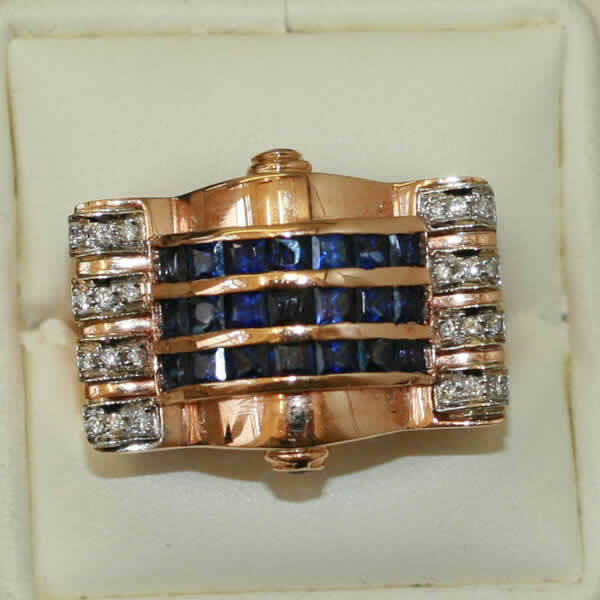 Made in 18ct rose gold, this fabulous ring is set with 21 carre cut (square) natural sapphires and 2 round sapphires on the side. To further enhance the sparkle of this ring, there are 12 diamonds set on each side. (24 in total). This is a wonderful ring that looks amazing on the finger!